Another recommendation and introduction by David Way, and an excellent visit to a quality-orientated estate. We met Valter Fissore, husband of Nadia Cogno and winemaker, along with Denise Quadrumolo, their person responsible for Marketing (and, interestingly, WSET Diploma student). We also met their epically-happy-to-see-you, fluffy, ginger-white winery cat and later their super-bouncy, terrier winery dog (alongside Nadia). Both ace. 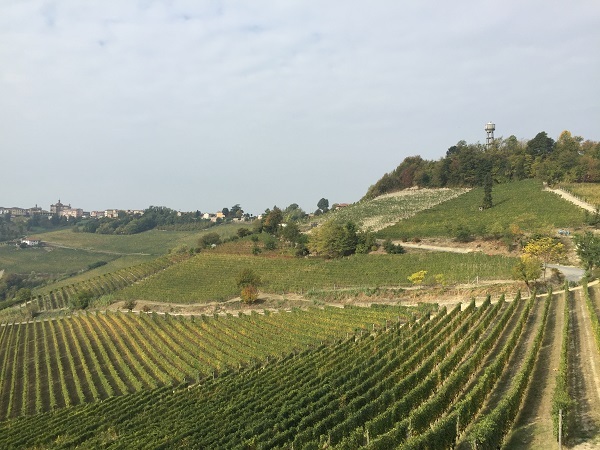 Based in the commune of Novello, Elvio Cogno focuses on Baroli including some cru bottlings, but also are one of the producers working to revive the Nascetta del Commune di Novello DOC. It was the finest example of the variety we tasted, amongst a fair few. 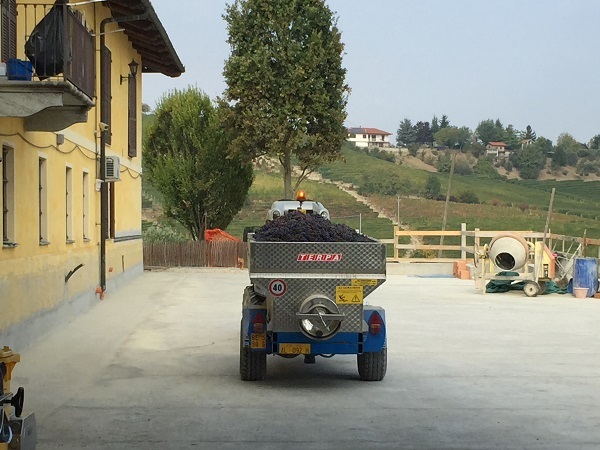 Barolo harvest was well underway when we visited, with a truck of Nebbiolo arriving for destemming as we watched. This gave us a chance to discuss some winemaking philosophy. With Dolcetto, they were achieving far more supple, approachable tannins than often is the case. Valter’s approach to that is primarily a fast fermentation and short skin maceration, to avoid the rusticity Dolcetto often presents. Dolcetto has very deep colour and plenty of flavour compounds which will extract quickly, so a 3-4 day fermentation will give all the flavour needed in 48 hours. After completion of fermentation, he decants off the skins to take to malolactic fermentation. In addition, its important to get ripeness right in the vineyard and to crush carefully to avoid any bitter seed tannins. With Nebbiolo, by contrast, he aims for long macerations even by local standards, with 40-50 days of maceration. This is intended to polymerise skin tannins with seed tannins that will re-extract quickly in 14-15% ABV ferments. Tannin perceptions initially rise, but then fall back somewhat after polymerisation. Here, the fine quality of the tannins permit this approach. Also, he destems very gently and crushes just enough to break the skins. He is experimenting with whole bunch fermentation on a tank of Nebbiolo, which will most likely be blended into other cuvées at this stage. His view of the incoming 2017s was good quality fruit, in spite of the very early harvest. Elvio Cogno has a plot of pre-phylloxera Barbera which they bottle separately. In 2017, this has very deep colour and firm tannins – the reverse of conventional Barbara – and is already revealing graphite minerality over a core of mixed fruit. We tasted a tank sample, which was attractive, in spite of the very fresh acidity from having just completed fermentation and not yet begun MLF! The regular 2017 Barbera also showed very deep colour but with much gentler tannins and a fruitier aromatic profile, with the 2017 Dolcetto also showing notably softer tannins than most Dolcetti – again, despite not yet going through MLF. Whilst we were tasting and I mentioned my label book, Valter brought down a bottle of Bricco Pernice that Pippa Middleton had signed when she had recently visited (she has WSET Level 3). Finally, when we had finished, Valter incredibly kindly signed and gave me a copy of Alessandro Masnaghetti’s excellent, very in-depth guide to Barolo and its MGAs – the Menzione Geografica Aggiuntiva – i.e. the crus. That generosity reflects his nature and the nature of so many people in the wine world. From the tasting room visit, in order tasted. A = Appearance, N = Nose, P = palate; scores are out of 20. Speciality of the house, resurrected and pioneered by the estate in the late-90s. 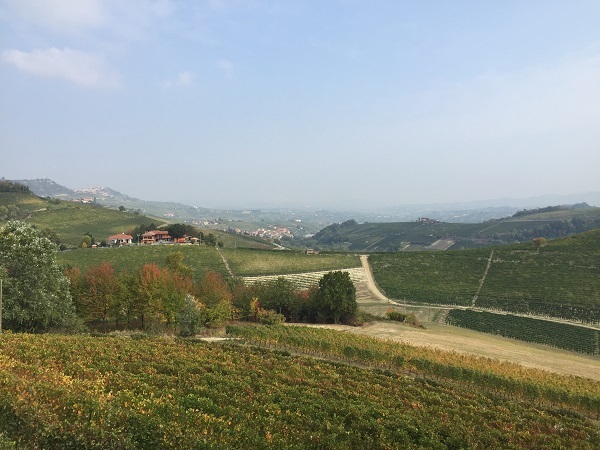 Now 8 producers in Novello are making Nascetta and an association has been formed, with around 30 producers across the Langhe. Grapes from the top of the hill of the Ravera cru. First vintage was released in 1994 with the DOC just being ratified in 2010. Only in Novello can the narrower, 100% Nascetta DOC be given. Valter characterises the grape as a semi-aromatic white and an interesting variety with good extract that can age like Riesling or Verdicchio. No MLF is done to retain freshness and linearity. 14% ABV. Some almond trees in the vineyard, hence the name. P: Pure blueberry and blackberry. Fresh, brisk acidity and moderate, well-managed, furry tannins. Bitter almond finish. Medium-long length. Cru of the Neive commune of Barbaresco, and make the wine at a winery of a friend in Neive to comply with DOCG requirements. P: Crisp, almost racy acidity, Medium-high, fairly fine tannins. Juicy red fruit. Just a little dilute on the mid-palate. Fair length of spiced touches. Some tomato leaf to mid-palate. ‘Baby’ Barolo bottling, made since 2006, using young (15 year old) vines from the Ravera cru vineyard on a steep-ish Southern-exposure. Intended to bring new generations into Barolo in a style that is easier to understand and approach – aim for a fruity, more linear and elegant, Pinot Noir style. Presence of the bottling also helps with replanting, as any new vines can always go into the blend. 60% Lampia and 40% Miquet Nebbiolo clones. Oldest vines on the estate at 70 years of age, planted 380m altitude and with plenty of wind, to give day-night temperature variation. 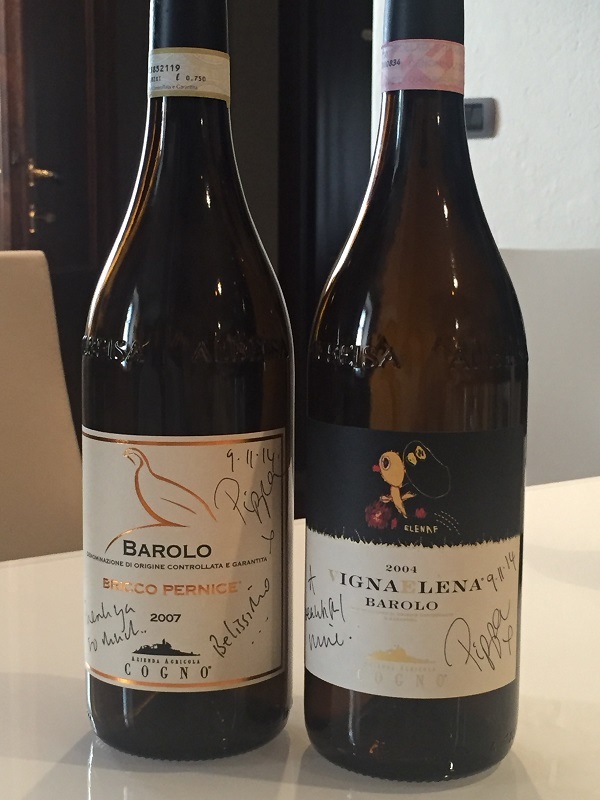 1991 was the first vintage, and Elvio Cogno was the first producer to bottle with the Ravera cru on the label. N: Ripe red and black cherry with marked chalky mineral overtones. Deep, dense nose. Almond skin touches. Hints of balsamic. P: Red cherry entry, some blackberry. Spice. Racy acidity with very fine powerful tannins. Tense. Warmer sub-zone than the main Ravera cru that is less sandy and more limestone, so produces more classical, firm Barolo. 100% Lampia clone. Held for 1 additional year in bottle to develop the tannins better, and may extend the time in wood and bottle in future – so have built extra cellar space to manage that additional time in wood and bottle. 2012 a little cooler vintage than 2013. A flagship for them. A plot within the vineyard planted with 100% of the rare Nebbiolo Rosé ‘clone’, that gives elegance and is also the latest-ripening, so likes warmer vintages, like 2011. 6 years total ageing, including 3 in botti. 4,000 bottles total production. In fact, after our return, I read an article that explained that Nebbiolo Rosé is in fact not a clone of Nebbiolo, but a different, closely-related variety. Bottled just 20 days before our visit.